A parliamentary report of 1777 recorded parish workhouses in operation at Leek Frith (with accommodation for 20 inmates), Leek and Lowe (70), Leigh (30), and Norton in the Moors (24). Leek had a parish workhouse on Brook Street — then called Workhouse Street. Parish workhouses also operated at Fawfieldhead (later sold, with its two acre site, to Sir George Crewe for £225) and Warslow. At Norton-in-the-Moors, a new parish workhouse was built in around 1798 on waste land adjoining the estae of Charles Adderley, almost opposite Norton Hall. It was extended in 1824-25 at its east end, possible to provide accommodation for the master and matron. Prior to then, there appears to have been a single large room on each of the two floors with a central stove. The inmates, who numbered seven in 1813, ten in 1814, and only two in 1815, were mainly the old, the sick, unmarried mothers, temporarily unemployed or disabled men, a few children, and steady flow of vagrants. Norton-in-the-Moors former parish workhouse from the north, 2004. County of Stafford: Bradnop and Cawdry; Endon Longsdon and Stanley; Fawfieldhead, Heathylee, Heaton, Hollings Clough [Hollinsclough]; Horton and Horton Hay, Blackwood and Crowborough; Leek and Lowe, Leek Frith, Longnor, Norton-in-the-Moors, Onecote, Quarnford, Rudyard, Rushton James, Rushton Spencer, Sheen, Tittesworth, Warslow and Elkston [Elkestones]. Later Additions: Butterton (from 1869), Grindon (from 1869), Smallthorne (1894-1922), Wetton (from 1869). The population falling within the Union at the 1831 census had been 18,387 with parishes ranging in size from Rudyard (population 117) to Leek and Lowe (6,374). The average annual poor-rate expenditure for the period 1834-6 had been £5,564 or 6s.1d. per head of the population. 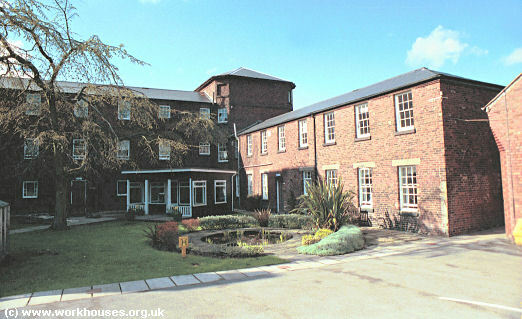 Leek Union workhouse was erected in 1838-9 at the east side of the Ashbourne Road to the south of Leek. The Poor Law Commissioners authorised an expenditure of £5,100 on construction of the building which was intended to accommodate up to 300 inmates. The building was designed by J Bateman and G Drury and was based on the model cruciform plan published by the Poor Law Commissioners in 1835. An entrance block at the west contained a porter's room, waiting room, Guardians' board room, and Clerk's office. To its rear, accommodation blocks radiated from a central octagonal hub. The ground floor of the hub probably contained the kitchen, while the upper floors were used as the Master's quarters and provided a vantage point from which to observe all other parts of the building. The workhouse location and layout are shown on the 1920s map below. Leek original Union workhouse site, 1920s. Leek entrance block from the south, 2001. 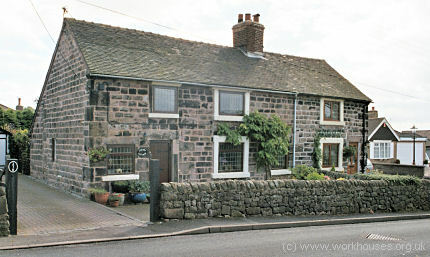 Leek accommodation ranges from the south, 2001. The workhouse, unnamed though identifiable as Leek, was the subject of an article in the magazine All the Year Round in December 1867. The article article drew attention to the treatment of vagrants at the workhouse who, in order to discourage them, were given no food or bedding. The arrangements for communicating with the resident nurse in case of a night-time emergency were also criticised. The author made much fun of the master's great pride in the workhouse's recently acquired hearse which had been bought in 1866 for the sum of £4 10s. from the Churchwarden of St Edward's Church. Since its purchase, the master explained, attendance at workhouse funerals had increased considerably. The full text of the article is available on a separate page. In 1871-2, a fever ward was erected at the west side of Ashbourne Road. The buildings were later much expanded, eventually becoming the Leek Isolation Hospital. An infirmary was added at the north of the workhouse in 1896-7. 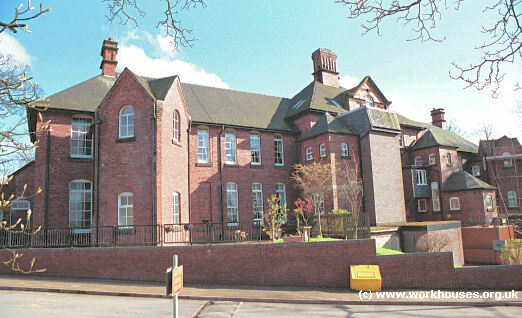 Leek infirmary block from the north, 2001. 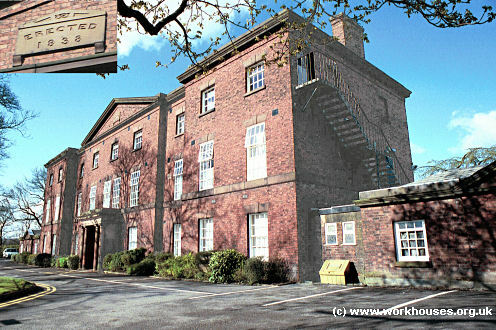 The former workhouse buildings later became Leek Moorlands Hospital and now provide geriatric care. Staffordshire Record Office, Eastgate Street, Stafford, ST16 2LZ. Holdings include: Guardians' minute books (1837-1930); Ledgers (1838-1928); etc. A Peep into the Past - Being a History of the Premises Forming the Leek Moorlands Hospital by Percy Walton.